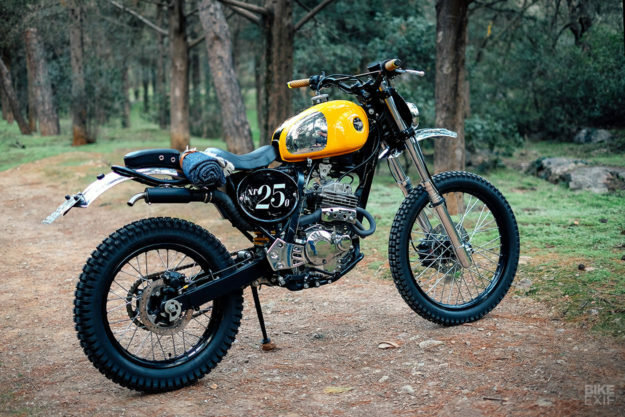 Trends in the custom world are as fickle as any other industry. 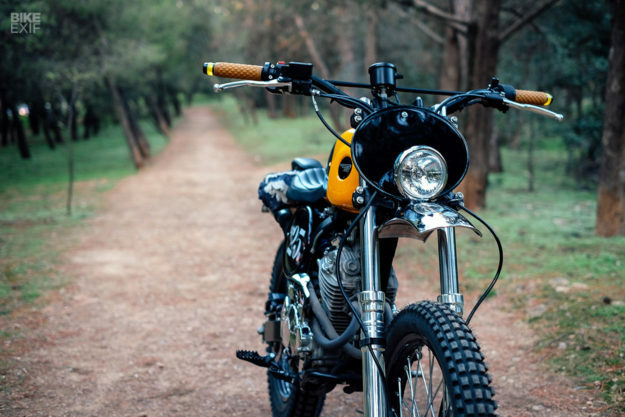 But there’s one style that seems to be enjoying a sustained resurgence: scramblers. That’s because dirt bikes are really, really fun. 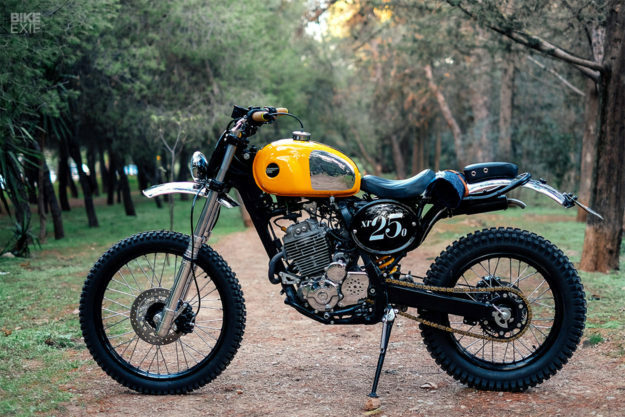 Just imagine getting lost on fire roads and camping in the woods aboard this peppy little XR 250 custom. If that thought doesn’t make you smile, check your pulse. The donor was a 99-model XR 250, reworked by the dudes at Urban Mechanics. Based in Athens, Greece, Mike and Tom have only been running the shop for a couple of years—but they’ve already started settling into a signature style. 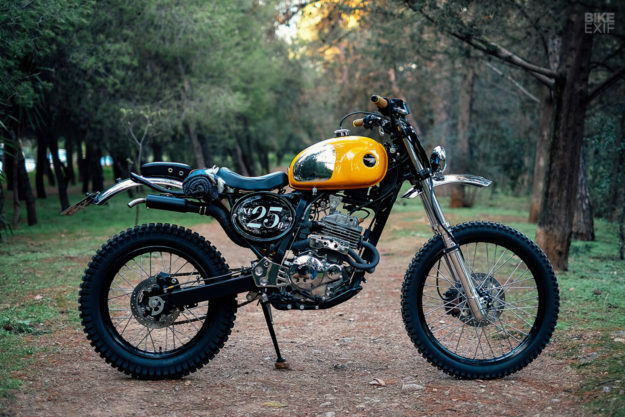 This build—codenamed ‘The Silver Sand’—has the same carefree vibe as their first project. Urban Mechanics were lucky enough to find a chromed Hodaka tank online—the perfect candidate for what they had in mind. With a few modifications, it mounted on just fine. 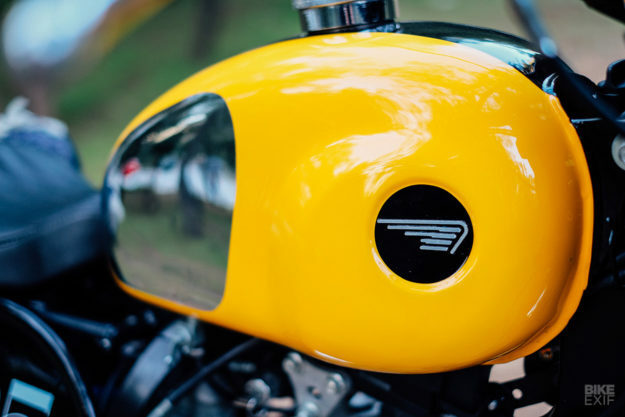 So they picked the Ducati SportClassic mustard yellow hue for their livery, got painting…and promptly ran into their first hurdle. Once the yellow coat was sorted—along with a black stripe across the top to complement it—hurdle number two reared its head. As it turns out, the tank was completely air tight, so the guys had to re-drill a hole for the fuel tap to get fuel to the carb. We’re glad they muscled their way through it, because the final effect is superb, down to the reinterpretation of the iconic Honda wings on laser cut aluminum badges. To continue the shiny theme, the lads added a pair of high-mounted chrome fenders, and had the XR 250’s engine covers chromed. There’s more goodness out back, where UM redesigned the subframe with a kicked-up loop to hold the fender. Seating is by way of a small solo perch, with a passenger pad out back and just enough space between the two for a blanket or tool roll. We honestly can’t figure out why there isn’t a luggage rack here (since we don’t see any passenger pegs), but hey, whatever—it looks cool. Things are kept street legal with an LED taillight, and a license plate mount that also houses the rear turn signals. 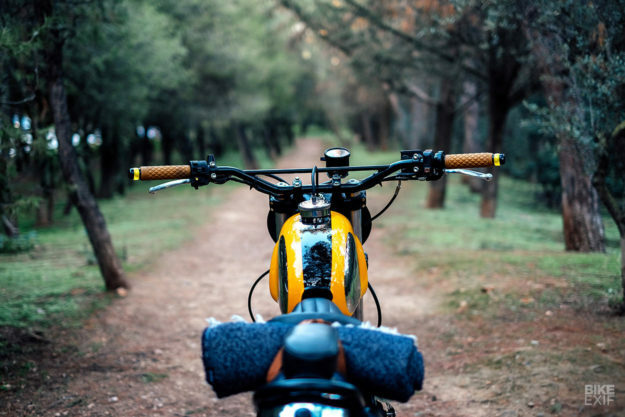 The front turn signals sit in the bar ends, with a small chrome headlight lighting the way. The side and front number boards are a nice touch too; they’re from fellow Greek outfit C-Racer. There’s a good mix of refurbishing and subtle massaging going on. The suspension is stock, but the forks have been lowered slightly, and the rear shock spring has been repainted. The frame and rims have been powder coated, and the wheels re-laced with new spokes. UM re-jetted the stock carb and fitted a DNA filter. They then added a small Biltwell Inc. silencer to the stock header—except, it wasn’t quite ‘silent’ enough for city use. 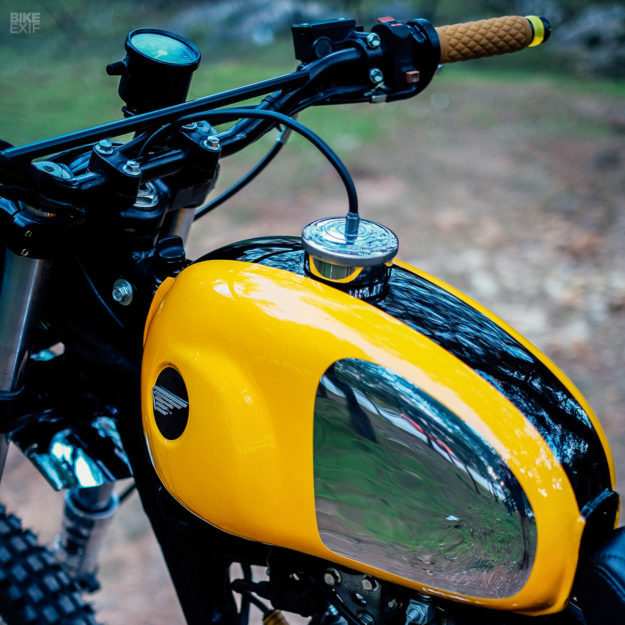 So they built a small dB-killing extension on, taking inspiration from classic two-strokes for the design. The exhaust’s heat shield is a one-off, as is the cute drilled sprocket cover. 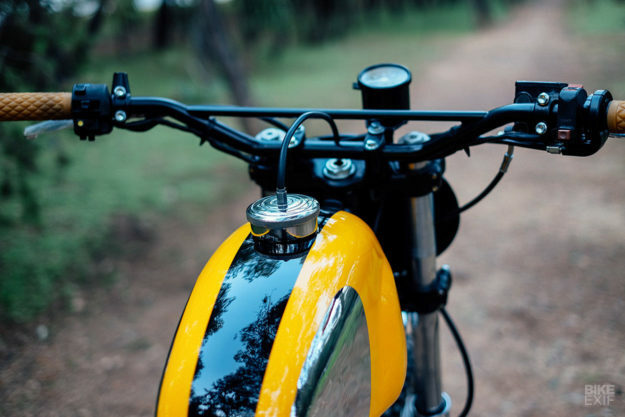 Though the XR 250 looks ready to tussle, every little detail has been seen too. 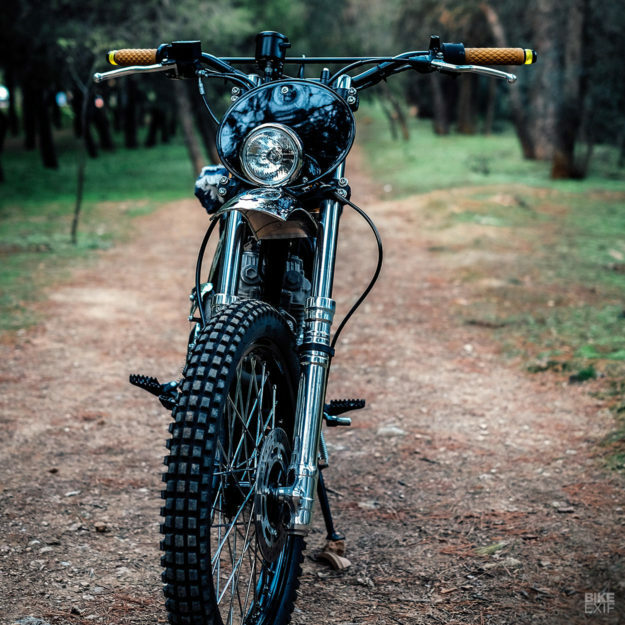 The Mitas trials tires are a perfect match, and so are the Tommaselli scrambler bars and Biltwell Inc. grips. The wiring’s been tweaked too, and now runs off a small Lithium-ion battery. And the original dash has been ditched for a small, off-the-shelf speedo. (Top marks if you can find the ignition). Honda XRs are known for being grunty and bulletproof—but style has rarely been their forte. But now Urban Mechanics have shown what can be done with a little ingenuity. It’s all the inspiration we need to shut our MacBooks and head for the hills.